We are fortunate enough to live in a walkable neighborhood of a walkable city, and sometimes days go by between car trips. I made up for all those blissful carless days in one fell swoop today, though. President Obama was visiting Seattle and I got stuck in traffic for almost two hours with five little girls in the back of that darn minivan. Luckily, we were well-stocked with snacks, and the girls were full of songs and laughter. My four-year-old told a detailed and breathlessly-enunciated story to anyone who would listen featuring characters named Macinnanin, Skingerque, Banana Peel, and Spoon Guy. (The spellings of those first two names are approximate at best.) The baby practiced her shrieks of joy at top volume. Other drivers stared at the ruckus my passengers were making and then laughed. Did you think this was going to be a post about how I came home hours late and cooked a nice dinner? Heavens, no. I collapsed on the couch with a beer and let J hustle the kids off to bed. (Thanks, honey!) We ate leftovers: this soup, that salad, those beans. Leftovers are a cook’s reward, I say. But if you don’t have a fridge full of good leftovers, make migas at the end of a frazzled day. There’s a reason I mostly cooked scrambled eggs for all those months when life was so hectic: they’re fast, filling, and delicious. The kids call these migas “cheesy chippy eggs” and eat their plain version (no salsa, no green flecks) without complaining. 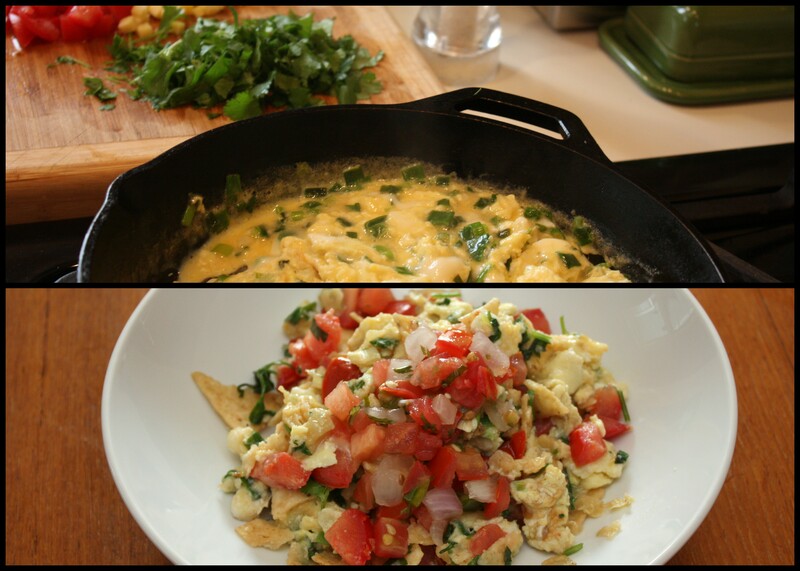 Migas take various forms in various countries, but this surely-Americanized version is basically scrambled eggs with lightly crushed tortilla chips, green onions, tomato, cilantro, cheese, and salsa, maybe with a warm tortilla on the side. Dinner will be served in ten minutes. Migas, adapted from Deborah Madison’s Vegetarian Cooking for Everyone: (These quantities are for 1 serving, so multiply by the number of people you wish to serve.) Saute 2 thinly-sliced green onions with a Tbsp. or two minced jalapeno (optional). When onions and pepper soften, pour in 2 eggs beaten with a splash of water and a pinch of salt. Scramble the eggs until nearly set, then stir in a big handful each of lightly crushed tortilla chips (you still want some big pieces), shredded jack or cheddar cheese, chopped cilantro, and a chopped Roma tomato (or a handful of halved cherry tomatoes). Stir for one more minute until the eggs are cooked, then taste for salt and serve topped with salsa. Optional: serve with warm tortillas for scooping. This entry was posted in Breakfast, Easily Multiplies to Feed a Crowd, Eggs, Feeding Kids, Food, My Favorite Recipes, Recipes and tagged 10 minute meals, carpooling, cilantro: love it or hate it, how to get away with eating chips for breakfast or dinner, migas, quick dinner, scrambled eggs, tomatoes, traffic on July 24, 2012 by emmycooks. Gosh. How dare President Obama create such a traffic jam! Such socialist BS from Kenya. Speaking of voting with your dollars, brava Emmy for the helping to spread the word about how tomatoes are harvested. Things won’t change unless we change what we buy and create a bigger market for better tomatoes and better worker treatment. I wasn’t organized enough to get officially involved with the campaign, but I thought I’d give it a shout out. I am actually heartened to see the progress that has been made on farmworker justice issues in this case, but there’s still a long way to go. Ivenever heard of Migas, but it could become another quick go to meal in our house, too. We have a few of those. Love that you were able to hold down the couch and relax with a beer while your husband put the kids to bed. Mine is a tuned in husband and dad too, but you don’t always hear about others. I don’t think I could make it through if I couldn’t hand off the kids and sack out on the couch on a regular basis. We’re the lucky ones for sure. Scrambled tortilla chips–yes please! I don’t know a single person who hasn’t loved migas once they’ve had the opportunity to try them. I should really remember these the next time I have no clue what to make for dinner (like tonight). Tortilla-chip-based meals are the best–these and our black bean chilaquiles are favorites around here! I love this story and can totally sympathize since I got stuck in 90 mins of traffic trying to get home myself last night…ugh. I’m embarassed ot admit I’d never had Migas before and then this weekend at Bacon & Eggs we had the most amazing ones ever. Now I want to try and create my own! Yes…it’s in Walla Walla…but worth the trip. Thanks for spreading the word about the Tomato situation Emmy! I was able to side-step that insane traffic by a hair yesterday. It was crazy! Thank YOU for writing about such an important issue! I remember first learning about the plight of tomato farmworkers in Florida from the late great Gourmet magazine, and I’m actually heartened to see that some progress has been made in the intervening years. I hope that enough public pressure will help to keep things moving in the right direction.